Virgin Galactic's SpaceShipTwo space plane fired its rocket engines for the first time during flight this morning in a test from California's Mojave Air and Spaceport. The vehicle was carried aloft by the mothership WhiteKnightTwo, and then released in midair at an altitude of about 46,000 feet (14,000 meters). 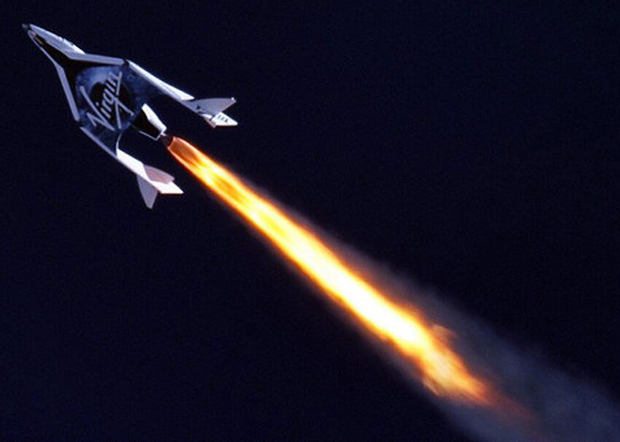 At that point, SpaceShipTwo test fired its rocket engine, designed to propel the craft of the rest of the way up to space. SpaceShipTwo is a suborbital vehicle, designed to carry space tourists on trips to the edge of space and back for $200,000 a ride. Though these flights wouldn't make a full orbit of the planet, they would provide passengers with a brief experience of weightlessness and a view of Earth from the blackness of space.